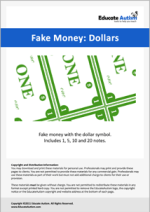 Dollar notes (fake ones) that could be useful for an alternative style token economy. The notes are in values of 1, 5, 10, and 20. 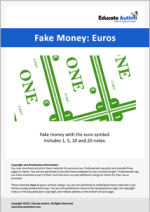 Euro notes (fake ones) that could be useful for an alternative style token economy. The notes are in values of 1, 5, 10, and 20. 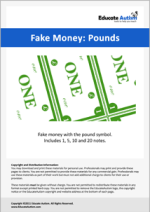 Pound notes (fake ones) that could be useful for an alternative style token economy. The notes are in values of 1, 5, 10, and 20. 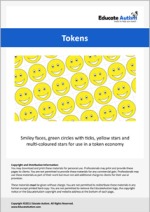 Tokens for a token economy. There are yellow smiley faces, green circles with ticks, yellow stars and various differently coloured stars. 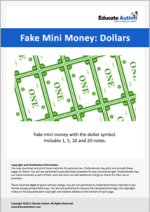 Mini Dollar notes (fake ones) that could be useful for an alternative style token economy. The notes are in values of 1, 5, 10, and 20. 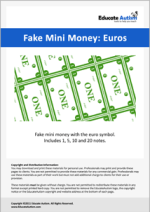 Mini Euro notes (fake ones) that could be useful for an alternative style token economy. The notes are in values of 1, 5, 10, and 20. 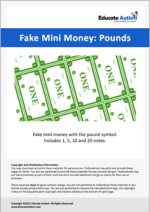 Mini Pound notes (fake ones) that could be useful for an alternative style token economy. The notes are in values of 1, 5, 10, and 20. Large-sized tokens for a token economy. This download includes 11 pages of various differently coloured stars. 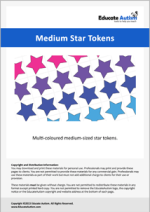 Medium-sized tokens for a token economy. 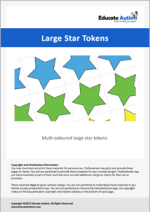 This download includes 10 pages of various differently coloured stars.